A few weeks ago I headed to Mount Seymour Provincial Park in North Vancouver. Mount Seymour was one of the nearby locations I had not visited in quite some time and thought I should check out again. I hadn’t been to Mystery Lake in 12 years, and didn’t really remember much of my last trip, so this was my first stop. As it turns out, even during a summer weekday Mystery Lake is a swimming destination. So rather than finding a quiet mountain lake I found boom boxes, beer and the scantily clad (or not). I did enjoy the view all the way up the Fraser Valley from up there, but with the relatively thick haze this was not all that photogenic either. The other destination I had in mind at Mount Seymour was Flower Lake. I didn’t quite have enough time remaining in the day to go all the way to Goldie Lakes, so that will have to be on my next trip (along with Dog Mountain). 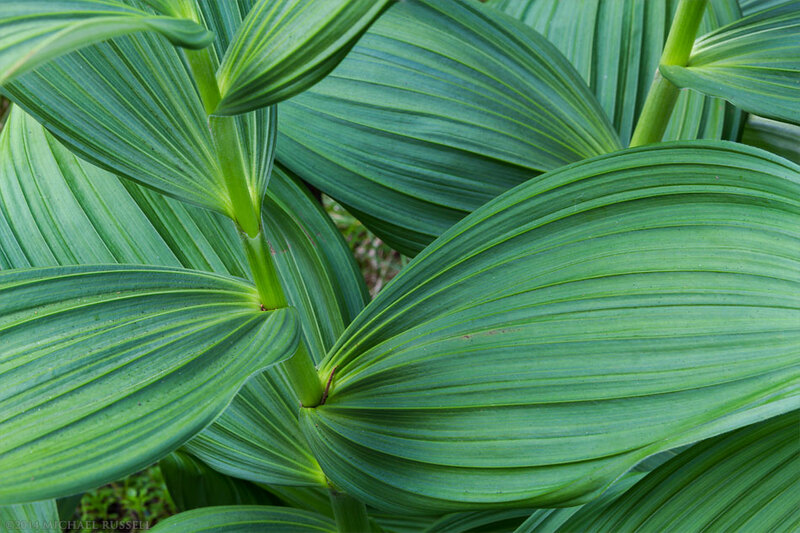 The Flower Lake Loop Trail was quite easy compared to the Mystery Lake Trail and actually offered more photography opportunities. The first of these was this near mature Corn Lily or False Hellebore (Veratrum viride). I haven’t photographed all that many of these, but I can see why they are a popular subject with the patterns and textures in the leaves. Flower Lake itself is not very large, and is really a rather large pond full of various species of aquatic plants including Yellow Pond Lily (Nuphar polysepalum) and Floating Leaved Pond Weed (Potamogeton natans) and many others. I didn’t see any frogs or tadpoles, but I’m sure there are plenty there. 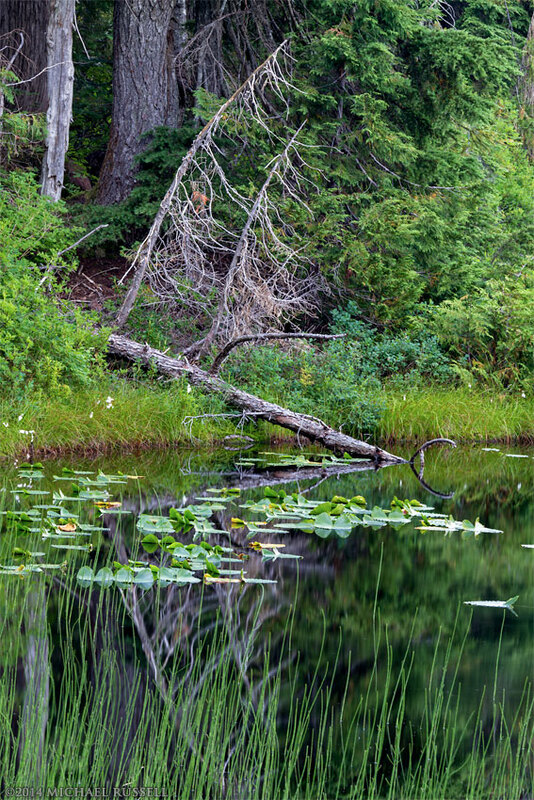 While the lake itself is a bit like any other lake in the forest, there was some interesting characteristics to the shoreline. 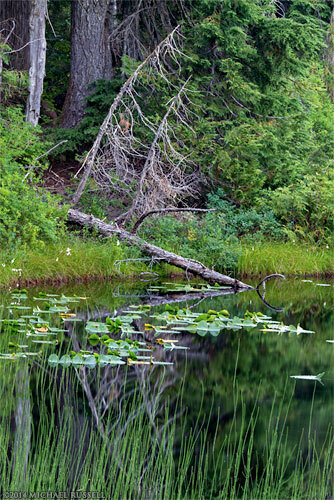 I made this photograph of a fallen and dead tree along the shore of the lake along with the aquatic plants. 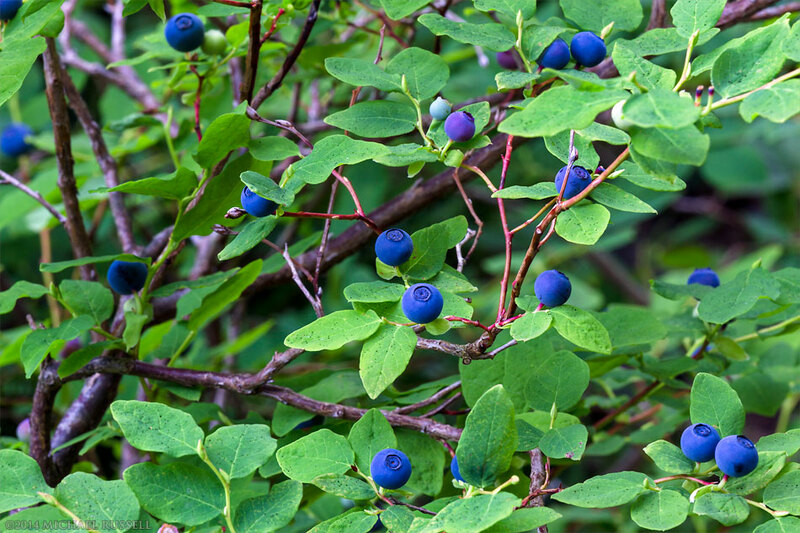 One of the features along both the Mystery Lake Trail and the Flower Lake Loop Trail was the ever present Oval-Leaved Blueberry (Vaccinium ovalifolium) bushes. Most of the bushes had a lot of berries on them, except in the areas near the parking lot where people (presumably) had been picking them. I found this particular bush full of berries right next to Flower Lake. maybe I am too used to the cultivated Blueberries in my own backyard, but these wild ones weren’t nearly as sweet. Perhaps it was just a bit too early in the season. From the Flower Lake Loop Trail I headed back to the parking lot and went to Ambleside Beach Park in West Vancouver to photograph the Lions Gate Bridge. For more images from this part of British Columbia please visit my Vancouver Coast & Mountains Gallery.